Commonwealth Auto Body has many services that will help get your automobile back as soon as possible. While we certainly make every effort to write a precise estimate the first time, this process sometimes requires minor disassembly of the damaged areas. Accurate estimates are the key to a smooth flow of the repair process. You and your insurance company know exactly what to expect and the repair process is fully inspected for top quality control. We understand the inconvenience of not having a vehicle while yours is being repaired. We can arrange for a rental vehicle so you are not without transportation. Most rental rates are in accordance with your insurance company allowances. If your rental allowance falls short, or if you have no rental coverage, we may be able to assist you. Our priority is our customers. Very reliable parts delivery from all dealers. Most parts are available to us same day, making the repair of your vehicle fast and efficient. The frame of your vehicle is as important to your car as the foundation is to your home. It must be solid and true before anything can be built or repaired around it. Metal repair and replacement is an extremely critical phase. We strive to use original replacement parts and factory approved repair procedures. All necessary corrosion protection procedures are used to meet or exceed factory corrosion warranties. 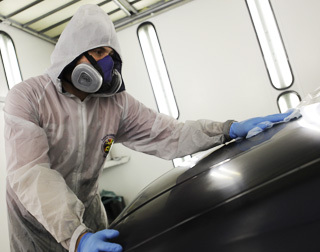 Automotive painting and refinishing is an artform. Matching the exotic finishes found on many of today's vehicles requires special expertise in application techniques, such as state-of-the-art equipment and trained technicians.